UPDATED – ORLANDO, Fla. (CNS) — In 1955 in Mississippi, a white woman lied and told her husband that Emmett Till, a black teen, flirted with her in the grocery story. In retaliation, her husband and another man kidnapped, beat, shot and lynched the youth. His body was found three days after his murder and returned to his native Chicago. His mother had an open casket for the 14-year-old’s funeral, where tens of thousands visited his body. Among them were an 11-year-old Edward Braxton, his brother, Lawrence, and his uncle, Ellis. They waited two hours in line to view the body. Uncle Ellis repeatedly told his nephews, “I don’t want you ever to forget this night.” And Bishop Braxton never did. Emmett’s killers were never convicted of murder. And when he visited the National Museum of African American History and Culture, he was transported to that day in 1955. 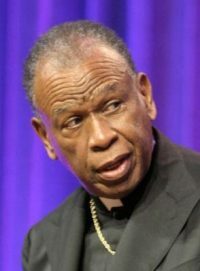 “For me personally, the most devastating experience in the history gallery was coming face-to-face with the original coffin of dear Emmett Till, which I had not seen in 60 years,” Bishop Braxton said during his keynote address July 8 at the National Black Catholic Congress in Orlando, adding that “dear Emmett Till” was one of 3,446 African-Americans lynched between 1882 and 1968. “I have never forgotten (my uncle’s) words. I have never forgotten the unrecognizable bloated, totally mutilated face behind the glass in that coffin. … Seeing that coffin again brought it back again,” he said. That was only one piece of history at the museum that registered great emotions for the bishop, who has written extensively on the racial divide in America from a theological and pastoral perspective. Among his writings are two pastoral letters, “The Racial Divide in the United States: A Reflection for the World Day of Peace 2015” and “The Catholic Church and the Black Lives Matter Movement: The Racial Divide in the United States Revisited,” issued in 2016. In his congress address, he described how the National Museum of African American History and Culture museum is in eyeshot of the monument to George Washington and the memorial to Thomas Jefferson, both of whom owned “enslaved free human beings.” Not too far away are the Capitol and the White House, both built in part by “enslaved free human beings,” as he put it. The history presented at the museum is not pretty but so important, and he urged everyone to visit the museum, especially the lower levels. “I realized 60 percent of the museum is actually underground and it is underground deliberately because the architect wanted to give you the feeling that you were … maybe inside a slave ship crowded with very little room to move about,” Bishop Braxton said. Although he recognized the museum as an outstanding achievement, Bishop Braxton in his remarks to the congress lamented the lack of references there to leading African-American Catholics such as Father Augustus Tolton, the Sisters of the of the Holy Family, Sister Henriette Delille, Father Pierre Toussaint, Mother Mary Lange, or Sister Thea Bowman at the museum. There are nearly 68 million Catholics in United States, but only 2.9 million are black. The bishop told congress attendees they could all do something to know their own history and to be engaged in the community. They must exercise their rights to vote, participate in public life, run for public life, use resources that develop discussion about the racial divide, inspire young people to become involved. The bishop said the prophet would not be satisfied with those words solely emblazoned on T-shirts, banners and bags. “Micah would demand to see these words written in our hearts, in our daily actions when we leave Orlando and return to our dioceses, neighborhoods, parish communities and families,” Bishop Braxton said. In talks a day earlier, Bryan Stevenson, a public interest lawyer, and Tricia Bent-Goodley, a professor and director of the doctorate program at Howard University School of Social Work, separately spoke about black communities, and the justice system and black family life. In speaking about “The Black Family: Challenges and Opportunities,” Bent-Goodley described the impact of mental health issues, community violence, and domestic violence on black families. She called on black Catholics to face these issues with both the power of prayer and the help of professionals. She noted that too often, black families don’t get the care and counseling they need; sometimes because of a lack of access and sometimes because of a reluctance to seek help. Gonzalez is on the staff of the Florida Catholic, newspaper of the Archdiocese of Miami and the dioceses of Orlando, Palm Beach and Venice.